Monday, May 6, 1:30 p.m.
Genocide in broad daylight does not happen without complicit neighbors. Father Patrick Desbois has documented for the first time how the murder of 1.5 million Jews in Ukraine happened publicly and with the help of local townspeople. At times the shootings were a public spectacle. Based on interviews with neighbors, wartime records, and the application of modern forensic practices, Desbois tries to understand how these killings happened so publicly and how neighbors saw their role. 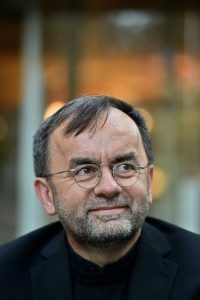 Father Patrick Desbois is the President and Founder of Yahad-In Unum. He was also, from 2001 to 2016, the Director of the National Service for Relations with Judaism, under the auspices of the French Conference of Bishops and, since 2003, consultant to the Holy See Commission for Religious Relations with Judaism. In 2016, Father Desbois was named the Braman Endowed Professor of the Practice of the Forensic Study of the Holocaust at Georgetown University’s School of Foreign Service.